Protest Gutierrez/Bush/Huckabee at Pro-Amnesty Conference in Houston | Stop Obama Now!! 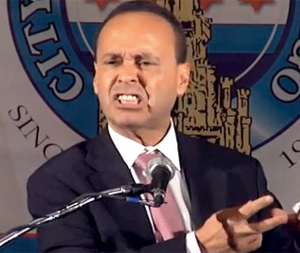 Jeb Bush and Mike Huckabee will be appearing with radical, anti-American congressman, Luiz Gutierrez at a pro-amnesty conference in Houston to promote immigration lawlessness. This is a call for patriot groups and individuals in the area to protest this gaggle of corrupt, lawless politicians at the site of the conference on opening morning. F.A. Hayek, in his book, “The Road to Serfdom,” said that the Nazi regime was a “moral” regime. That is, not because it was a good government, but because they used so-called “moral” arguments as an excuse that the Nazi regime should not follow existing law. After the rule of law is destroyed, a would-be dictator can substitute his own “moral” judgment to justify his illegal acts. That article is total BS. It¹s not an amnesty conference! It¹s Hispanic Faith group of 34,000 Hispanic churches. Whoever wrote that article has no clue. I’ve known Mike Huckabee since 1975. I met him while attending Southwestern Baptist Theological Seminary. Since those days, Mike has become Gov. Mike Huckabee. Gov. Mike Huckabee has been invited to speak in the pulpits of many of America’s largest churches repeatedly. In all the years that I have known Mike Huckabee, noone has ever questioned his theology. I really wish the media would double check their sources. I”m sure Gov. Mike Huckabee or one of his staff would love to have the opportunity to answer some of these ignorant and uninformed news articles.